The Babylon Project was our last, best hope for peace. It failed. By the 3rd Season, Babylon 5 cannot stay neutral in the wars brewing all around them. +++ A critical episode; important to the 5 year storyline. ++ Character development / Important back-history. + A throw-away – could be missed, and never noticed. The Lurker's Guide to Babylon 5 is the source of the following episode description links. While an Earth official investigates the mystery ship encountered by Lt. Keffer in hyperspace, Londo attempts to sever his ties with Morden. Sheridan receives a new tool in the fight against the Shadows. Sheridan and Ivanova try to deal with an association of cargo pilots. An alien probe makes first contact with the station. G'Kar's position among the Narn is threatened by the arrival of a Centauri-appointed liaison. Lyta Alexander returns to the station at Kosh's behest. One of Theo's brothers discovers that he may have a hidden past. Draal helps the crew attempt to contact more of the First Ones. Sheridan works to hide his conspiracy from the Nightwatch. An addictive drug with telepathic effects is found on the station, prompting a visit by Bester. G'Kar reaches a turning point. Marcus and Dr. Franklin combat an invasion by parasitic aliens that attach themselves to humans. Ivanova investigates the possibility of bringing a new member into the conspiracy. As the Senate continues to investigate President Clark, an archaeologist brings news of a development back home that forces Sheridan to act against the Earth government. The Nightwatch tightens its grip on the civilian population. As the Earth Alliance plunges toward civil war, internal strife threatens to shatter the command structure of B5. Zack's loyalties are put to the test when the Nightwatch is ordered to take over station security. Londo receives another glimpse of his destiny. When President Clark tries to seize control of Babylon 5 by force, Sheridan is faced with the prospect of severing the station's ties with Earth. Delenn receives disturbing news from a Ranger. Babylon 5 at its finest. Winner of the 1997 Hugo award for Best Dramatic Presentation. The Nightwatch orders its members on Babylon 5 to target Delenn in an attempt to undermine Minbari actions during the recent crisis. Londo presents Refa with an ultimatum. Londo introduces Vir to a surprising new acquaintance. A heavy influx of Narns to the station raises suspicions. As Sheridan and Ivanova try to gain recognition of the station's new status among the alien governments, a traveler arrives with an unbelievable story out of distant legend. Bester finds himself at odds with others within the Psi Corps and seeks Sheridan's help, offering information about the Shadows in return. G'Kar presses for admission to the conspiracy of light. Sheridan tries to rally support for his cause as direct confrontations with the Shadows begin in earnest. Friction increases between Londo and Morden. Ambassador Sinclair returns to pull Babylon 4 through time (see "Babylon Squared.") Part 1 of 2. Lyta tests the limits of the Shadows' newly-discovered weakness. Dr. Franklin goes on a journey to discover his place in life, and meets a singer in Downbelow. The new Ambassador Kosh arrives on the station. Londo uses G'Kar and Vir to gain power in the Centauri Royal Court. Sheridan is consumed by his analysis of the Shadows' strategies. Sheridan launches a preemptive strike against the Shadows. Franklin jeopardizes his life while trying to do a good deed. Third season finale. A face from Sheridan's past takes him on a dangerous mission to meet his Shadow counterpart. Londo receives important news about his political future. 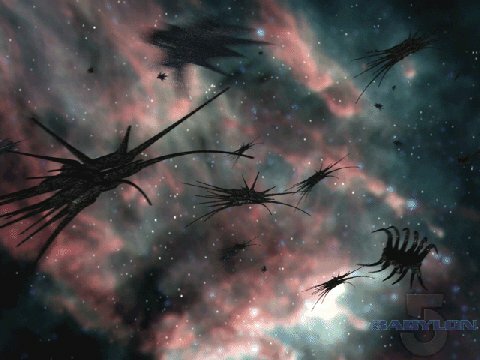 The Shadows mass a fleet against Babylon 5. Warner Bros. holds copyright © and trademark TM 1992-1998 to "Babylon 5," the Babylon 5 logo, and all publicity photos and images from the series.